There are approximately 13 million patients suffering from severe mental disorders (SMD) in China. It is estimated that the treatment rates of schizophrenia and bipolar disorder in China (based on expert opinion) are only 30% and 5% respectively. Adding to this problem is the limited number of service providers in China, for example the psychiatrists and nurses’ number only 1.85 and 3.77 per 100,000, which is much lower than the global average levels at 3.7 and 5.1. 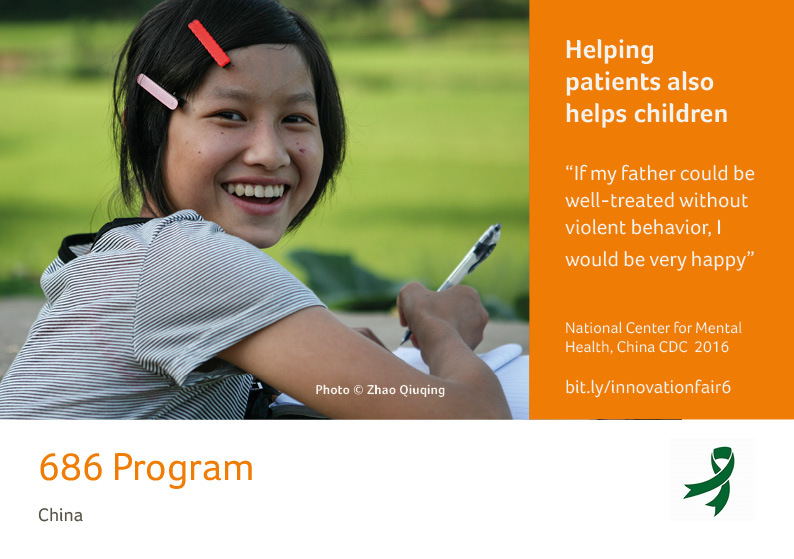 The 686 programme in China aims to address the current challenges around the lack of integration between hospital and community health care in terms of the management, medical therapy and rehabilitation for patients suffering from SMD. Therefore the specific goal of the innovation is to establish an all-round and comprehensive mental health management service network, so as to improve the accessibility and equity of the mental health service for people suffering from SMD. Professor Byron Good, Department of Global Health and Social Medicine, Harvard Medical School. In 2004, with the disappearance of SARS and reconstruction of China's public health system, Project 686 obtained the financial support from central government, as a unique non-infectious disease program. The program aims to provide comprehensive service for patients with severe mental disorders (SMD), to improve the accessibility and equity of the service by integrated management and treatment within hospital and community settings. The program began with a pilot, which gradually worked towards production of an information system, an assessment system, etc. Relevant policies were also revised in order to guarantee the progress of work for this programme. New pilot programmes were established in accordance with the development of the project. In 2015, Phase II of Project 686 was launched, and 40 cities participated in the 3-year pilot program of comprehensive mental health service. The development of a region-based and national level-based training system is a key element in the development of the 686 program. In 2005, there were 557 mental health institutions in China, and only 13,122 practicing psychiatrists (China Health Statistical Yearbook). In order to scale up mental health services into the community, the Community-based Prevention and Control Team of Mental Illnesses was established. Peking University Mental Health Institutions, Shanghai Mental Health Center, The Second Xiangya Hospital of Central South University, Mental Health Center of West China Hospital, Huaxi University undertook the training of their surrounding 7-8 provinces and cities, and established a team of national-level lecturers with 108 senior professors and lecturers. They provided training for psychiatrists, nurses, administrators, GPs, community health workers, policemen and patients’ families. This large scale training program was conducted for 11 years. The training materials were produced in China, most of which were originally produced by Project 686. Psychiatrists were provided with two “basic” training sessions, which included basic techniques and basic knowledge of SMD, such as the standardized treatment for schizophrenia and bipolar disorder, assessment, and interview skills. The main aim was to improve the standard treatment provided by psychiatrists and to provide guidance. In addition, training was provided to community physicians, which included popularizing management, law and ethics regarding community prevention and control. Training sessions were provided to personnel from each Project 686 office. This training included information on prevention, treatment and management training of community mental diseases. The key points covered were: project management, case management, data quality control, standardized treatment, information system, rehabilitation, leadership, health education, emergency intervention, basic research capabilities, etc. GPs, nurses, community workers, public health workers, community management workers and community police were provided with local training sessions which were organized and implemented by the provincial and municipal project office. Training was also targeted at patients’ families and this was organized by local institutions. 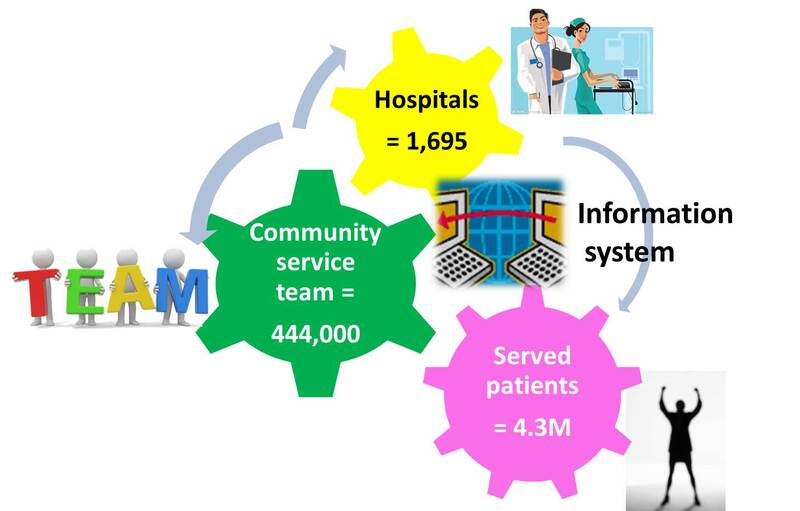 In 2005, the Ministry of Health of China developed a program-based registration information system in order to collect patients’ information. In 2011, the National Information System for Psychosis was launched; patient data including in-hospital and community follow-up information were put into the system. The information was found to be useful for community health workers as it provided reminders for follow up. The information was also integral for policy makers in order to provide statistical data for analysis, including calculation of e.g. medication, poverty etc. The Government of China was responsible for pushing the 686 program forward; this included investing central government funds. The government also required local governments to provide matching funds for this programme. Finally the government also included community mental health services in the local government performance evaluation. The development of expert teams is the key factor to ensure the services quality. Intensive training was provided to a range of health providers and communities. This ensured that service providers, either professionals or non-professionals, had appropriate knowledge and skills of working with someone suffering from SMD. Information management was needed to ensure that monitoring and evaluation of the current situation services patients receiving care. This data is also important for governments to making future polices. There is a continuously increasing need of services for patients suffering from SMD, however the capacity of supply is severely insufficient, for example there is a great lack of physical therapists and social workers. There are also great disparities of resources and services in different regions. The society is not yet prepared to accept recovered SMD patients who are returning to society. The social stigma is extensive in China. By receiving additional aid from additional provinces in China, the 686 Project is gradually being implemented in some provinces and cities which have not yet established any mental health service institutions, such as Tibet. The program is improving its service network, integrating and securing resources, and exploring policy breakthrough via the establishment of 40 pilot cities (since 2015 with a plan of 3 years) in Phase II. For example, the Ministry of Civil Affairs is going to initiate the establishment of Community Rehabilitation Institutions, which aims to provide rehabilitation services for patients with SMD, helping them to recover and integrate back into society. Established teams are also involved in the scale up of the service. Scaled up services include the community referral of commonly seen mental problems (such as depression), a hotline of crisis intervention, financial security for SMD patients, and additional services for patients’ children. The annual assessment objectives established in 2005 were mainly focused upon implementation of the project, maintaining central financial funding, and continuing to expand investment. The program was evaluated by using data from the National Information System. There have been no studies on cost-effectiveness. From 2005 to 2015, over 25,100 personnel received the training. In 2005-2014, a total of 180 “two basic” training sessions were held in different regions, with a total of 11,457 psychiatrists been trained. A specialized training was also provided for 261 physicians in the Western regions where human resources are insufficient. Approximately 60% of psychiatrists nationwide have attended the training at least once. From 2005 to 2015, there were over 180 training sessions held by the National Project Office, with a total of 6600 people been trained. In 2015, the National Project Office began to try the approach of “match in replacement of training”, which further promoted the learning initiative of the trainees. From 2005 to 2011, education of patients’ care, drug treatment, adverse effect observation as well as basic rehabilitation knowledge was given to 385,700 patients’ family members. Numerous educational materials in local institutions have also been published.